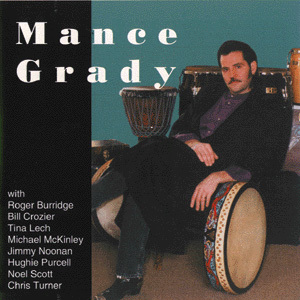 In 1992, Mance first released this instructional video which takes the beginner on a step by step path to learning the basics on playing the bodhran. Much of it is filmed in the viewer's perspective (over the right shoulder) which makes it a lot easier to understand what the player's relationship is towards his bodhrán. This video also features one of Mance's solos which demonstrates his inimitable style. The DVD has 3 additional solos, from 1990, 1991 and 2005. For this self-titled album featuring the bodhran, Mance invited some wonderful musicians in and around the Boston area for an exciting venture in traditional Irish music, as well as some more contemporary arrangements. Instrumentation includes fiddle, mandocello, flute, banjo, harmonica, accordion, jaw harp, as well as bodhrán, African djembe, and congas, to name a few.